T7 robot provides best-in-class mobility, manipulation, and intuitive control, delivering uncompromised performance. 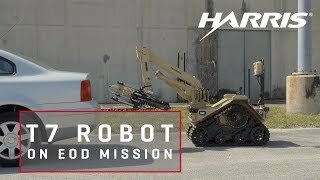 Based on the inputs of hundreds of users, Harris has developed the T7 robot from the ground up to support the demanding requirements of commercial and military missions, including hazardous materials (HAZMAT) cleanup, explosive ordnance disposal (EOD), intelligence, surveillance and reconnaissance (ISR) and special weapons and tactics (SWAT) missions. T7’s highly intuitive interface redefines ease of use with immersive force feedback, providing unmatched command and control. Its precision control and human-like dexterity shorten task completion time and improve mission effectiveness. The T7 robot system has the strength and dexterity to tackle any challenge. Its rugged, automotive-grade track system provides outstanding mobility and maneuverability. A variety of attachments enable use of standard-issue sensors, disruptors, and tools, supporting a wide range of commercial and military missions, including HAZMAT and vehicle-borne improvised explosive device (VBIED) defeat. In the configuration shown, T7 includes a pan, tilt, and zoom (PTZ) camera mast, high power multiple-input and multiple-output (MIMO) radios. 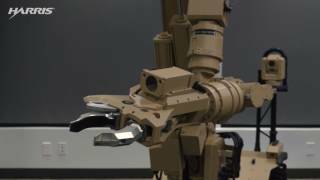 The T7 robotic system from Harris Corporation provides best-in-class mobility, manipulation, and intuitive control, delivering uncompromising performance for a variety of missions including bomb disposal.